The John Chard Decoration and John Chard Medal Series was instituted by Queen Elizabeth II in 1952 (just two short months after she became Queen) and it is the last medal to issued by a British monarch and worn by members in all four South African military formations – Army, Navy, Air Force and Medical Service. The John Chard Medal was instituted by Queen Elizabeth II on 6 April 1952, during the Tercentenary Jan van Riebeeck Festival, to replace the South African Union Defence Force’s Efficiency Medal and the Air Efficiency Award which had been awarded to members of the Citizen Force between 1939 and 1952. The John Chard medal series is a ‘service medal’ awarded for pre-determined tenure of service to the statute South African defence forces. 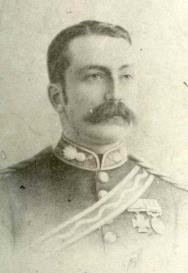 The two officers, John Chard and Gonville Bromhead both earned Victoria Crosses’ along with nine others in defending Rorke’s Drift against a Zulu army attack. This is the largest tally of Victoria Crosses (the ultimate British award for Valour) from one single engagement, per head this battle has the highest concentration of bravery awards and decorations ever received (11 Victoria Crosses, one VC Mentioned in Dispatches and 4 Distinguished Conduct Medals). There were only just over 150 British and colonial troops who successfully defended the missionary and crossing at Rorke’s Drift against an intense assault by 3 000 to 4 000 Zulu warriors. It is an act that has never been repeated, and likely never to happen again. So why so many Victoria Crosses for so few defenders? 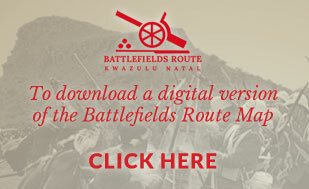 Well, simply put, a significant part of the British expeditionary force had been annihilated at the Battle of Isandlwana earlier on the same day, 22 January 1879, and the little missionary and crossing at Rorke’s Drift was the last line of defence should the Zulu Army have built on its victory at Isandlwana and invaded the British colony. The Natal Colony would have been for the most part left defenceless whilst Lord Chelmsford and the remaining bulk of British forces searched for the Zulu army in the Zulu Kingdom itself. The action of these ‘few’ at Rorke’s Drift literally saved an entire British colony. For his role in the heroic defence of Rorke’s Drift, Queen Victoria awarded the Victoria Cross to him. He also received a promotion to captain (he would retire a Colonel). The Lieutenant-General adds, that its success must, in a great degree, be attributable to the two young Officers who exercised the Chief Command on. We learn something new every day… what makes this surprising is that a medal issued by a British Monarch remained in the service of The South African Defence Force for so long, especially after it was reformatted after the National Party took South Africa out of the British Commonwealth and they embarked on a campaign to change the South African military emblems, insignia and medals and rid the SADF of anything “British” (especially the Queen’s crown which now had to go). In many instances these changes where resisted and a number of civilian force “Regiments” where able to hold onto some of their British heritage. However, the medal sets where all changed and new medals instituted, except the John Chard Service medal series which survived the changes. The medal was awarded to all ranks of the Citizen Force for twelve years’ efficient service, not necessarily continuous. After a further eight years a recipient could qualify for the award of the John Chard Decoration (JCD). In 1986, this was changed to allow Citizen Force members to earn the John Chard Medal after ten years’ service, not necessarily continuous and the John Chard Decoration after twenty years. The ribbon also carries the arm of service, crossed swords for the South African Army, a spread eagle for the South African Air Force, an anchor for the South African Navy and a Rod of Asclepius for the South African Medical Service. 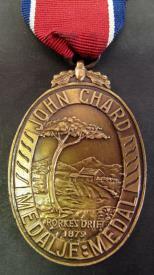 A ‘bar’ also existed for The John Chard Decoration, which signified 30 years’ service. The John Chard decoration/medal series continued in the SANDF from 1994, but was finally discontinued in 2003 and replaced by the SANDF’s new long service medals. This was done when the African National Congress (ANC) political dispensation did a sweeping change to all military emblems and insignia to rid it of anything the ‘nationalists’ or ‘colonialists’ instituted. The John Chard medal is now superseded by the SANDF’s Medaljie vir Troue Diens and the Emblem for Reserve Force Service. The John Chard medal (and decoration) is still recognised as an ‘official’ medal issued to a statutory force member, and is still worn very proudly in the South African Reserve by those who have received it.